Recently, I have posted on a variety of European and Asian geopolitical topics. This post will offer my observations on the impact the American midterm elections will have on the USA going into the future. International readers of my blog may especially appreciate an American perspective on our tumultuous American political situation. I think our American politics may look very confusing to people in other nations (Why not? They look confusing enough to those of us who live here!). First, let’s review the actual results. If the Democrats attack the White House with investigations, the Republican Senate can launch equally intense investigations into Hillary Clinton’s lawless use of a private server with unprotected classified documents on them (this would draw in many high Obama officials as targets), the Uranium One scandal wherein the Obama administration’s high officials signed off on selling a large percentage of American uranium production to Russia, etc. Such reciprocal investigations could be very poisonous for our nation. However, in what I see as a Trump preparation for an investigations war, he “fired” Attorney General Jeff Sessions, who was a weakened official ever since he suddenly recused himself from all the special prosecutor issues once he took office. The new Attorney General will surely be a pro-Trump official who will take firm control of the Department of Justice, the FBI, and the Special Prosecutor’s office. Democrats should take heed to what happened in the aftermath of the recent hearings on Judge Kavanaugh’s appointment to the Supreme Court. The “witch-hunt” like the atmosphere of those hearings galvanized Republicans and it likely led to the loss of several key Democratic Senate seats. 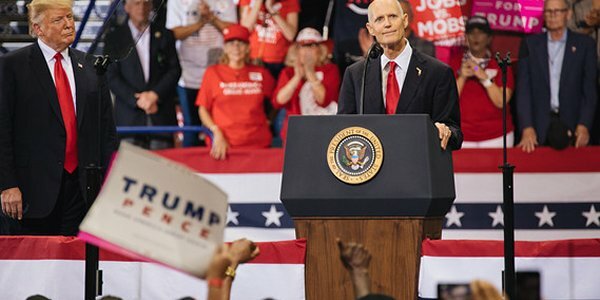 The Democrats lost seats in Indiana, Missouri, North Dakota, and Florida they may have won if the Democrat incumbents had voted to approve his nomination. Only one Democrat in the Senate voted to confirm Kavanaugh, and he won his re-election bid in a very pro-Trump state (West Virginia). If the Democrats launch more “witch hunt” investigations, they may reap a very bad harvest of ill-will from the American voters. If vindictive House investigations become the new norm, you can be sure Senate Republicans will also launch hearings into illegal and rigged voting by Democrats. The second link, third link and fourth link offer fertile ground for the beginnings for such hearings. President Trump may secretly not be unhappy that the Democrats took the House. With shared power comes shared responsibility. Since the Democrats and Republicans now each hold one wing of the Congress, both are now equally responsible for ensuring the nation status quo is a good one as they both will have to run on the record of the next two years in the 2020 elections. If there is a crisis or collapse of some kind in the next two years, Democrats could have put all the blame on the Republicans if the Republicans had controlled the entire Congress and White House. Now that the Democrats control one house of Congress, that issue is not available to them. If gridlock results, Trump is actually placed in a good position. He is really only responsible for bills once they reach his desk for either his signature or his veto. If Congress can’t pass bills, Trump can, credibly, blame Congress. He could also increasingly govern by Trumpian-scale Executive Orders if Congress is paralyzed. There is a possibility that Trump may declare a state of emergency on the nations’ southern border due to drug trafficking and illegal immigration, and militarize the border. Importantly, the US Senate will be far more pro-Trump. Anti-Trump Republican senators were removed in Arizona and Tennessee and replaced with pro-Trump Republicans (although the Arizona election is still not finalized). Anti-Trump Democrats were replaced by pro-Trump Republicans in North Dakota, Missouri, Indiana, and Florida. Since the US Senate approves all federal judges and cabinet appointments, Trump’s appointees will have a much easier time of it during the next two years. Coincidentally, just days after the election, Judge Ginsburg, the oldest member of the Supreme Court’s liberal wing, had a severe enough fall to break several ribs (fifth link). She is 85 years old, and there has been speculation regarding how much longer she will be able to serve on the court. If she cannot serve, Trump will have another Supreme Court nomination to make, and the new Senate will be much more likely to easily confirm a conservative constitutionalist appointee. Another aspect of this election worth noting is the continued bad performance of pre-election polls in close races. In the RealClearPolitics.com polling reports, the Republicans did much better than predicted by the polls in, for example, Senate races in Indiana, Missouri, Florida and a governor’s race in Ohio. On election night, I watched Fox News, CBS, and CNN for election returns. One analyst (I forget who) commented that many Americans no longer share their views with any pollster, but election results have confirmed that those not speaking with pollsters are mostly Republican or pro-Trump voters. This means that Republicans may often be doing several points better in future close races than the polls indicate. Those living in other nations with parliamentary governments actually have two advantages over we Americans. In America, campaigning for the next election begins, unfortunately, the day after each election ends. Our campaign cycle never truly ends in America. In parliamentary nations, there is usually a 60 or 90-day election cycle if snap or special federal elections are called. I envy my international readers in that they actually get breaks from political campaigns. We Americans never really get such a break, and the American media obsesses about every nuance of American politics to the exclusion of important foreign events (as some of my posts have noted). The second is that in America we have two dominant political parties that control our electoral system like two binary stars orbiting each other endlessly in opposing paths. Parliamentary elections often have many parties which must come together to form a governing coalition after an election. That can also result in gridlock, but at least the candidates do group together in changeable blocs. In the USA, the Democrats could easily subdivide into a Green, a Socialist and a Labor party. The Republicans could easily subdivide into a Capitalist and a Christian Religious party. The two-party system that controls America is not required by our Constitution. Indeed, I don’t think our Founding Fathers even visualized the formation of political parties. However, the two-party system is now so entrenched in American politics that it would take a huge upheaval to alter it. The election results will have minimal effect on US foreign policy. The USA will stay firmly pro-Israeli in Mideast politics, and, if anything, Trump will have an even stronger hand in conducting foreign policy everywhere. The reason is that all treaties with other nations have to be considered and approved by the Republican Senate. The Democratic House has no role in treaty consideration or approvals. It should be an interesting two years as we begin the political cycle for the next federal election! I hope that these comments are beneficial to international readers and to American readers as well.